That is my old hand, but more specifically that's my aching thumb joint. Last night it really hurt after my evening music lesson. And it was still painful when I woke up today. I'm sure it's the same arthritis everyone gets as old age creeps up. But I wasn't ready for it just yet. I called my piano teacher today to see if she had any great ideas. (She is in her 80's.) She suggested Zostrix arthritis cream, a topical over-the-counter drug. She recommended an orthopedic doctor who specializes in hands. She also recommended against playing scales. Yippee! When I saw my personal trainer today, I also talked to a physical therapist who thinks she might be able to help me. When any body part is not working right, we suddenly realize how important it is. And so with my thumb. I can't play much music without it. 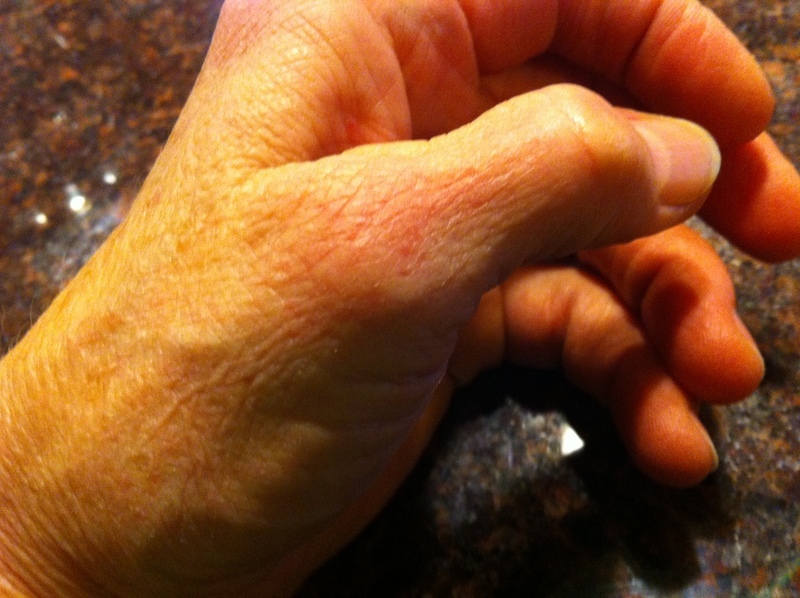 And it is on my dominant hand, which affects much of what I do in life. I'm hopeful that time and perhaps some of the noninvasive approaches to my sore thumb will fix this problem. Just one more reminder that I am growing older.